Phillip Ndowu | Banner Jaclyn Greene, freshman health major, enjoys a taste of fresh citrus given to her by a volunteer at the Citrus Tasting and Family Festival in California Citrus State Historic Park in Riverside, Calif. 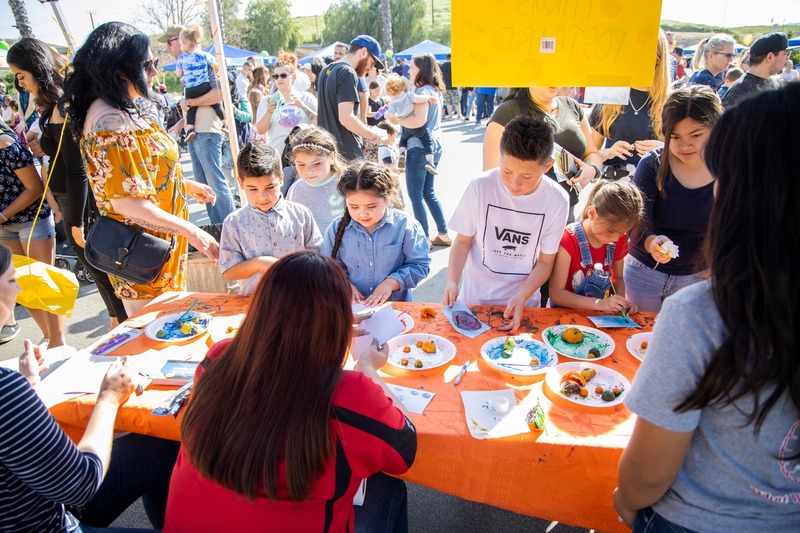 The citrus fans of Riverside celebrated March 24 as the California Citrus State Historic Park officially opened the season with its annual Citrus Tasting Festival. This year, the state park celebrated its 25th year. us, they had 25 citrus fruits on display for the public to sample for free. The event is put on with the aid of the Friends of California Citrus Park, the non-pro t management company of the groves. Sarah Mundy, executive director and general manager of Friends of California Citrus Park, said the turn out at the event was the largest she had ever seen. “This tasting event is something they have done annually and it is very well-attended. Last year, I think we had about 500 people. Based on the parking situation, I think we have tripled that,” Mundy said. Mundy said the group for which she works also aids in other large aspects of the park such as fundraising. History is a major focus at the California Citrus Historic Park. At the visitor’s center, many exhibits showcasing the history of citrus in Southern California are on display. Terrill said preserving the history of the citrus industry is one of the main focuses of the park. “We focus on the local history, people involved, laborers, the communities involved, the multicultural landscape, different immigrant and migrant groups who came to work in the citrus industry,” Terrill said. Jaclyn Greene, freshman public health major, said she enjoys history, so walking through the visitor’s center and viewing the different exhibits was her favorite part of the event. She said she also enjoyed the opportunity to get to know the Riverside community a little better. “It was a good opportunity to be around people you wouldn’t necessarily meet on a normal basis. It was a very diverse and different group of people and that was really cool,” Greene said. At the tasting tables, Greene tried many different varieties of citrus including lemons, oranges and grapefruit. Terrill said while the park focuses on preservation, it is also a working citrus grove. “We sit on almost 300 acres and the bulk of it is dedicated to Washington Navel oranges, which are the oranges that gave this region its rise to prominence, making Riverside and inland Southern California the citrus empire that it is today,” Terrill said. Across the street, Gless Ranch sells fresh oranges and other citrus along with nuts and different candies for an affordable price. The next time one finds a few spare hours on their hands, they should consider stopping by the California State Citrus Park for an afternoon of learning about the history of Riverside and its role in the citrus industry.